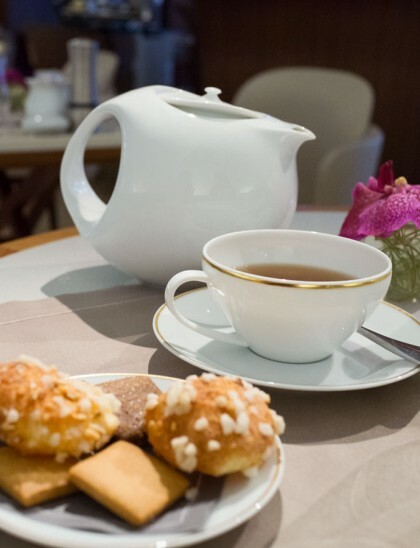 Another leisurely afternoon tea in Paris, but this time, at the five-star hotel Le Bristol Paris. Before even walking through the doors, I was awed by the enchanting entrance. Pretty! 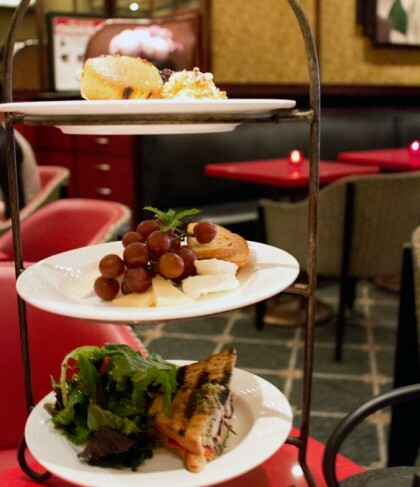 Deep into the lobby, is a seating area, Le Jardin Francais, for afternoon tea, cocktails, and small bites. I didn’t love the space since with all that marble, it doesn’t feel as warm as I would have liked. It didn’t help that the space was open to the lobby, so it felt less cozy. However, points for the chandeliers and plush seating. Excellent! I got there a little earlier than my friend Diane, and I was asked by two different servers if I wanted to read a newspaper. Everyone I encountered during tea service was very friendly and aimed to please. I felt totally pampered. A lovely and varied selection of loose leaf teas. I went with a Jasmine green tea, which was very nice. Diane ordered a black tea and the server asked if she warm milk to go with it. What a thoughtful touch! We ordered two of the Thé Complet Bristol, their afternoon tea service. Oddly, it doesn’t include scones, but instead, we got a madeleine and a muffin. Loved the varied types of sandwiches and how they tasted freshly made. A grilled cheese with ham sandwich was a bold move, since hot sandwiches never hold up very well once they cool. I made sure to eat that first. My favorite, which I want to recreate at home, is the roasted tomato on puff pastry. I also like the presentation of the salmon and dill tea sandwich. SCONES: Not Applicable. No scones were served. A regular sized blueberry muffin and a madeleine were served instead. The top tray was a bit of a disappointment since everything on there was full-sized, and not miniature versions. The middle tray held most of the sweets, aside from the top tray with the cookie and brownie. Loved these mini treats! I was a bit shocked at how many were served per person and even asked if these portion sizes were the norm. Indeed, they were. Two pieces each from every row of sweets per person. Great selection, and great flavors. As for the cookie and brownie, they seemed a little bit of an afterthought and I just took a bite of each. Since it was afternoon tea for two people, it was a little hard to share the full-sized sweets on the top tray. The savories and mini sweets were excellent, but I wish we had scones instead of the entire top tray of sweets. Your pictures are simply stunning. Makes me feel as if I'm in Paris! Thanks for sharing your afternoon tea party. Hi Alli, thanks for the compliments! Tea at Le Bristol was quite a treat! Yes, tons of food! Smart move on sharing one. Oooh, I’ll have to add the Peninsula to my list for the next time I’m in Paris!